AutoEXPRESS Five Stars Winner - Best Buy! 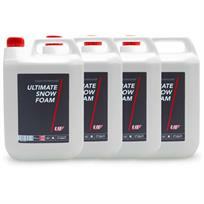 Don't miss out - Buy 3 x 5 Litres of Ultimate Snow Foam and receive 1 x 5 Litres absolutely FREE !! Ultimate Snow Foam is a PRE-WASH CLEANER designed to remove excess grime, lifting dirt away from the surface, thus reducing the risk of scratching during subsequent washing. This new formula produces more foam, offers improved cleaning action and is designed for use with either a Foam Gun or a pressure washer Foam Lance. NOTE: Snow Foam is a pre-wash cleaner designed to be used in conjunction with normal shampoos. The amount of foam produced will be dependent upon the dilution ratio, water pressure and the application method.